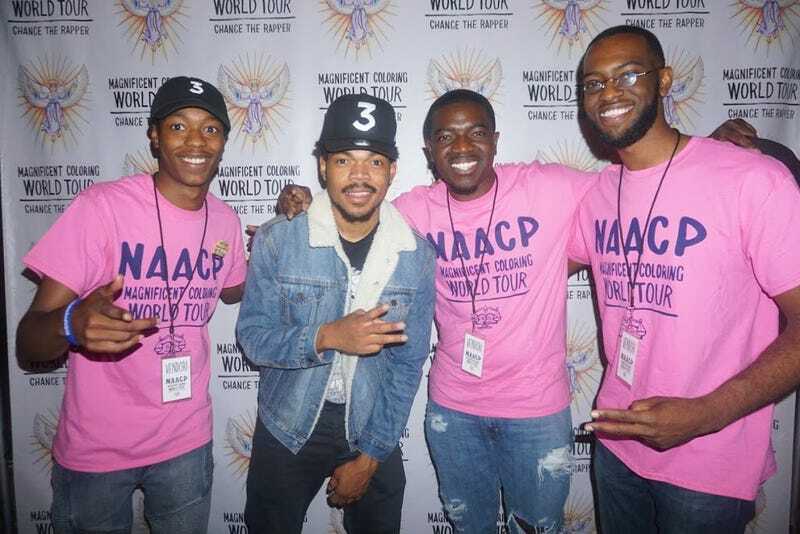 Chance the Rapper (second left) is set to appear at the NAACP’s “People’s Inauguration” on Jan. 21, 2017. The NAACP Youth & College Division will be hosting two events the day before Donald Trump's first day in office to fight against civil rights threats. In partnership with Justice League New York and the Empowerment Movement, the NAACP will hold a “People’s Inauguration” rally at Howard University in Washington, D.C., on Saturday, Jan. 21, at 9 a.m., and Chance the Rapper is scheduled to appear as a guest speaker. The organization's #StayWokeAndFight initiative is a direct response to Trump's taking office and will involve protests and other forms of activism. Organizers also plan to host a “People’s Inaugural Ball” on Friday, Jan. 20. Registration is currently open online for individuals and groups to join and attend. Chance the Rapper is no stranger to activism and has been a strong voice in his city of Chicago.